We stand behind our products and our goal is to provide the best support and warranty in the industry. All RPX products are covered by a 1-year minimum warranty and many include limited lifetime warranties. As RPX is the original manufacturer of most of our products and components, repairs are fast and cost-effective. In the event that a DynaVibe needs repaired, please email support@rpxtech.com and request a Return Merchandise Authorization (RMA) number and return instructions prior to return shipment. Receive a link to our product manuals where they are available for instant download. NIST traceable certification is available for customers working on certified aircraft using the DynaVibe Classic or DynaVibe GX . Certifications are valid for 12 months. Due to the custom equipment required for calibration, certification can only be performed at our Stillwater, OK, USA location. Please email sales@rpxtech.com with your calibration request and we will assign an RMA reference number for you and send you return instructions. Q: If my propeller was statically balanced, is there any need to dynamically balance it? A: Yes. Static balancing is a great first step, but things can change once a statically balanced prop is mounted. The dynamic balancing process encompasses the entire propeller assembly, so even mounting a statically balanced prop does not ensure there will be no vibration from the prop assembly. Q: Can the DynaVibe be used on geared prop installations? A: Yes. It actually works very well on geared assemblies since the geared drive puts the engine vibration frequency at a different frequency than the prop vibration frequency. This makes it easier to isolate just the prop vibration. Q: Will the DynaVibe work on a 3+ blade prop? A: Yes. The number of blades on the prop is irrelevant in the balancing process. Q: Can the DynaVibe be used with turboprop and radial engines? A: Yes. Everything focuses on the prop assembly—it doesn't matter how the prop is driven. We have many customers using the DynaVibe on turboprop aircraft. Regarding radial engines, the orientation of the cylinders is a cause for concern since vibrations from combustion are in the same direction as the prop vibration. However, we've had several customers use the DynaVibe on aircraft with radial engines with great results. Q: Can dynamically balancing my prop help me gain more power? A: It can. Improved performance is certainly one benefit of a balanced prop assembly. When the prop is out of balance, it directs energy toward shaking the airplane instead of propelling it. Q: What kinds of weights do I need to use and where can I get them? A: Visit the Balancing Hardware page of our website for this information. Q: What can be causing the DynaVibe reading to fluctuate or give inconsistent results? Hold RPM as stable as possible when balancing. It will take several seconds at a stable RPM for the reading itself to stabilize. The engine should be running smoothly from idle to max RPM. Don't try to balance a prop with a rough engine! Route all of the DynaVibe wires well away (4" or more if possible) from spark plug wires or other sources of electrical noise. Make sure there are no loose components on the engine that can be moving, such as the spinner, magnetos, exhaust pipes, alternator, etc. Keep the accelerometer mounting bracket as short and stiff as possible. If the bracket starts to resonate, the magnitude and phase angle will be affected resulting in an incorrect measurement. Q: What RPM should I use to balance? A: The best readings can be taken at cruise RPM, or the maximum stable RPM safely sustainable for one minute. Q: How often do I need to dynamically balance my propeller? A: Opinions differ on this subject, but most people in the General Aviation community agree that once is not enough. We address this question in detail on our blog, which we recommend that you read. Essentially, anytime anything changes on the prop assembly, we recommend that the prop be dynamically balanced, even if the prop has simply been removed and re-installed. Fortunately, it is easy to dynamically balance a prop with DynaVibe. Q: I dynamically balanced my prop, but I'm still experiencing a vibration. What should I do? A: Most vibrations are caused by prop assembly imbalance, however, sometimes the vibration source lies elsewhere. The DynaVibe GX3 will allow you to do full spectrum analysis to help you locate the source of more complex vibrations. Our blog shares several case studies of troubleshooting these more complex vibrations. ​Q: What does the angle measurement mean on the DynaVibe reading? A: The angle is the location where the prop assembly is too heavy. Either remove weight at this angle (measured from the master blade in the direction of prop rotation), or add weight at the reading angle +/-180 degrees. Q: Are the DynaVibe accelerometers fragile? A: No. We make our own accelerometers using state-of-the-art sensor technology, not piezo crystals. 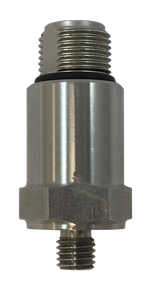 DynaVibe accelerometers are quite tough and will not be damaged by normal handling or drops. While it is possible to crack or chip the sensor's epoxy housing, we have never had sensor failure due to accelerometer mechanical damage. Q: Can DynaVibe Classic be used to balance anything other than a propeller? A: Yes! Some of our customers are performing airplane tire balancing with their DynaVibe system. DynaVibe is capable of balancing just about any type of rotating machinery, and DynaVibe has also been used to balance industrial meat slicers, industrial fans, and even commercial snow blower impellers and brush cutting equipment! Q: Can the DynaVibe Classic be configured to read where to add weight instead of where to remove weight? A: Yes. Simply mount the accelerometer upside down (with the cable pointing toward the hub). Q: Does the DynaVibe Classic tell you how much weight to add/remove? A: The DynaVibe Classic tells you what correction is needed by indicating the vibration magnitude and angle (where weight is needed). You will get an indication of how weight affects the IPS reading after your first measurement, correction, and subsequent reading. For example, if your initial reading is 1.00 IPS and one washer reduces the out of balance to 0.75 IPS then you know that one washer corrects 0.25 IPS. Therefore, it will take an additional 3 washers of that size to balance the prop assembly. Q: When using DynaVibe for vibration analysis, what do the different vibrations (e.g. half-per, 1-per) mean? A: The DynaVibe GX3 supports vibration analysis, and we've put together a table that summarizes the cause of the vibrations you might see when you do a vibration survey. We're always happy to help our customers understand the results they are getting during prop balancing or vibration surveys, so don't hesitate to contact us by email or telephone with your questions. Q: Do I have to send the unit to the factory for software updates? A: Not usually. The DynaVibe GX is designed to be updated in the field by the user by simply copying a few files to the SD card. Q: Which DynaVibe models are compatible with the DynaTrack? A: The DynaTrack is only compatible with the DynaVibe GX3. If you have a DynaVibe Classic, please contact us about our upgrade offers. If you own a DynaVibe GX2, the upgrade to a DynaVibe GX3 is free with the purchase of a DynaTrack. Q: How do I balance a turboprop? A: Balancing a propeller on a turboprop aircraft is identical to balancing the propeller on reciprocating engines. Simply install the accelerometer as close to the propeller as possible in the 12 o'clock position and then mount the phototach that detects a small piece of reflective tape on the propeller blade or spinner backplate. The standard DynaVibe Kit, either a classic or GX, can be used to reduce vibrations from propeller imbalance. If more advanced analysis is needed for analyzing the high-speed turbo machinery, then a DynaVibe GX3 with turbine kit (turbine sensor pictured above) enables analysis of internal engine components, such as gears, bearings, and rotor imbalance. The DynaVibe GX and DynaTrack may be updated in the field. We periodically release updates and the updates are FREE. The latest update and instructions for the DynaVibe GX and Dynatrack can be found here. Request access to our growing library of rotorcraft application notes below! Can't find the answer here? Contact Us! We make every effort to provide the best technical support in the industry. If you need assistance, please don't hesitate to contact us right away by email or phone. We do recommend using the support email address, as it reaches several members of our technical staff that can help you. When emailing, please provide as much information as possible, including your phone number. If at all possible, include a picture of your setup if you are currently working on the aircraft. The pictures are a tremendous help and are often the key to finding a quick solution!